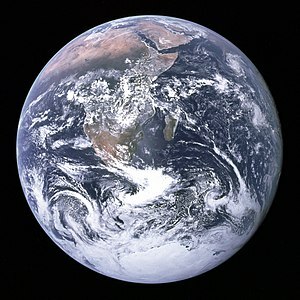 An Earth analog (also referred to as an Earth twin or Earth-like planet, though this latter term may refer to any terrestrial planet) is a planet or moon with environmental conditions similar to those found on Earth. ↑ 1.0 1.1 Overbye, Dennis (November 4, 2013). "Far-Off Planets Like the Earth Dot the Galaxy". New York Times. Retrieved November 5, 2013. ↑ 2.0 2.1 2.2 Petigura, Eric A.; Howard, Andrew W.; Marcy, Geoffrey W. (October 31, 2013). "Prevalence of Earth-size planets orbiting Sun-like stars". Proceedings of the National Academy of Sciences of the United States of America. 110 (48): 19273. arXiv:1311.6806  . Bibcode:2013PNAS..11019273P. doi:10.1073/pnas.1319909110. PMC 3845182  . PMID 24191033. Retrieved November 5, 2013. ↑ NASA – Mars Ocean Hypothesis Archived 2012-02-20 at the Wayback Machine. ↑ 15.0 15.1 Hashimoto, G. L.; Roos-Serote, M.; Sugita, S.; Gilmore, M. S.; Kamp, L. W.; Carlson, R. W.; Baines, K. H. (2008). "Felsic highland crust on Venus suggested by Galileo Near-Infrared Mapping Spectrometer data". Journal of Geophysical Research: Planets. 113: E00B24. Bibcode:2008JGRE..113.0B24H. doi:10.1029/2008JE003134. ↑ "Cassini-Huygens: News". Saturn.jpl.nasa.gov. Archived from the original on 2008-05-08. Retrieved 2011-08-20. ↑ Petigura, E. A.; Howard, A. W.; Marcy, G. W. (2013). "Prevalence of Earth-size planets orbiting Sun-like stars". Proceedings of the National Academy of Sciences. 110 (48): 19273–19278. arXiv:1311.6806  . Bibcode:2013PNAS..11019273P. doi:10.1073/pnas.1319909110. ISSN 0027-8424. PMC 3845182  . PMID 24191033. ↑ Jenkins, Jon M.; Twicken, Joseph D.; Batalha, Natalie M.; Caldwell, Douglas A.; Cochran, William D.; Endl, Michael; Latham, David W.; Esquerdo, Gilbert A.; Seader, Shawn; Bieryla, Allyson; Petigura, Erik; Ciardi, David R.; Marcy, Geoffrey W.; Isaacson, Howard; Huber, Daniel; Rowe, Jason F.; Torres, Guillermo; Bryson, Stephen T.; Buchhave, Lars; Ramirez, Ivan; Wolfgang, Angie; Li, Jie; Campbell, Jennifer R.; Tenenbaum, Peter; Sanderfer, Dwight; Henze, Christopher E.; Catanzarite, Joseph H.; Gilliland, Ronald L.; Borucki, William J. (23 July 2015). "Discovery and Validation of Kepler-452b: A 1.6 R⨁ Super Earth Exoplanet in the Habitable Zone of a G2 Star". The Astronomical Journal. 150 (2): 56. arXiv:1507.06723  . Bibcode:2015AJ....150...56J. doi:10.1088/0004-6256/150/2/56. ISSN 1538-3881. Retrieved 24 July 2015. ↑ 24.0 24.1 24.2 NASA Staff (20 December 2011). "Kepler: A Search For Habitable Planets – Kepler-20e". NASA. Retrieved 2011-12-23. ↑ 25.0 25.1 25.2 NASA Staff (20 December 2011). "Kepler: A Search For Habitable Planets – Kepler-20f". NASA. Retrieved 2011-12-23. ↑ Erkaev, N.V.; Lammer, H.; Elkins-Tanton, L.T. ; Stökl, A.; Odert, P.; Marcq, E.; Dorfi, E.A. ; Kislyakova, K.G. ; Kulikov, Yu.N. ; Leitzinger, M.; Güdel, M. (2014). "Escape of the martian protoatmosphere and initial water inventory". Planetary and Space Science. 98: 106–119. arXiv:1308.0190  . Bibcode:2014P&SS...98..106E. doi:10.1016/j.pss.2013.09.008. ISSN 0032-0633. PMC 4375622  . PMID 25843981. ↑ Torres, Guillermo; Fressin, François (2011). "Modeling Kepler transit light curves as false positives: Rejection of blend scenarios for Kepler-9, and validation of Kepler-9d, a super-Earth-size planet in a multiple system" (PDF). Astrophysical Journal. 727 (24): 24. arXiv:1008.4393  . Bibcode:2011ApJ...727...24T. doi:10.1088/0004-637X/727/1/24. Archived from the original (PDF) on 5 May 2011. Retrieved 20 March 2011. ↑ Clifford, S. M.; Parker, T. J. (2001). "The Evolution of the Martian Hydrosphere: Implications for the Fate of a Primordial Ocean and the Current State of the Northern Plains". Icarus. 154: 40–79. Bibcode:2001Icar..154...40C. doi:10.1006/icar.2001.6671. ↑ Villanueva, G.; Mumma, M.; Novak, R.; Käufl, H.; Hartogh, P.; Encrenaz, T.; Tokunaga, A.; Khayat, A.; Smith, M. (2015). "Strong water isotopic anomalies in the martian atmosphere: Probing current and ancient reservoirs". Science. 348 (6231): 218–221. Bibcode:2015Sci...348..218V. doi:10.1126/science.aaa3630. PMID 25745065. ↑ "Wolfram|Alpha: Making the world's knowledge computable". www.wolframalpha.com. Retrieved 2018-03-19. This article uses material from Earth analog on Wikipedia (view authors). License under CC BY-SA 3.0.